Fish is extremely useful, because it contains all the vital amino acids. In addition, when compared with meat, more fish are rich in vitamins and minerals such as phosphorus, iodine, fluorine and potassium. Very tasty fish fried. Prepare the fish carcass for roasting. If the fish is frozen – first of all defrost it. Then clean, gut and scrape the scales. Very convenient to cut the fish with a knife with long thin blade. Cut off the inedible parts - the head, tail and fins. Make a long incision on the back along the spine and separate the meat from the bones. You must have two halves boned, but with skin. If desired, you can remove it. Rinse again obtained fish fillets, cut into serving pieces and dry on a paper towel. Then season with salt and pepper. Can use ready seasoning for fish. Leave the fillets to rest for about 15 minutes – the fish zamarinuetsya and will not fall apart when frying. 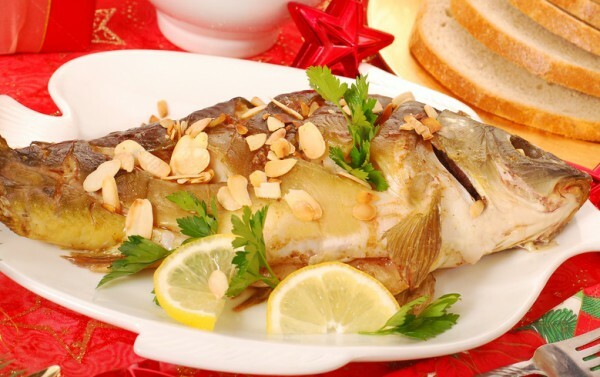 If you are cooking sea fish – add a little lemon juice, it will block odor. Prepare onions and carrots – wash them and clean. Slice onions into thin half-rings, carrot grate on a coarse grater. Prepare the pan where you will fry a fillet. Make sure it was completely dry, otherwise the oil will splatter. Put it on medium heat and pour a little vegetable oil. When the oil is hot, gently place in the pan the pieces of fish. If necessary, slightly reduce the heat. While the fish is roasted on one side, in another pan sauté in small amount of vegetable oil onions and carrots. After 7 minutes from start of cooking fish, gently flip the pieces and place on top of the browned vegetables. Cover and reduce heat to low. After 10 minutes, fried fish with onions and carrots will be ready. Decorate the finished dish with fresh herbs and garnish serve boiled potatoes. If you don't want to cut the fish yourself, buy ready-made fillet, in this case, all the preparation for roasting is to ensure to thaw, wash and dry fillets. River fish has its fans. Despite the presence of small bones and a peculiar smell that fish love and cook often enough. In order dish turned out even tastier, you need to know a few secrets of making roasted fish. About what the fish delicious - sea or river, there's a lot of controversy. Some think river fish are too bland, while others believe that it is sweeter and more flavorful. In addition, the annoying presence of many small bones and the "swamp" smell. Although everyone has different tastes, ability to cook fish in a pan is very important for every housewife. The fish was really tasty, you should know a few secrets of its preparation. You should not get too carried away with seasonings. The basic seasonings for fish are salt and pepper. Do not add salt and spices to the breading as the fish will be tough and fragrant and delicious is just the crust. The spices sprinkled on the fish before frying, not during it. Processing river fish before grilling, the usual. You need to clean fish from the scales, cut off the fins and head, gut it and remove the black film. Then rinse under running water. Use the breadcrumbs or not – everyone decides. But still it is recommended that at least a little to roll the fish in flour. Fry fish on a regular refined sunflower oil. But it turns out much tastier fish, fried in olive oil or blends of vegetable oil and butter, taken in equal parts. There is also a method of cooking fish without the fat. When cooking fish in this way on a heated pan poured salt in a thin layer and heated until then, until the grains of salt will begin to "jump". Salt is then removed and immediately placed the prepared fish. Before you start frying, the pan is strongly heated, then put the oil and then fish. About the amount of oil necessary for frying fish, there are several opinions. Someone said that the better fish to fry in minimum amount of oil. Others recommend not to feel sorry for him so that it was boiling in the pan. It is believed that the fish will not absorb excess oil. But with a lack of it may burn and not be covered in a delicious Golden crust. Fry the river fish to form a crispy crust, this pan does not have cover. The first five or even eight minutes, the fish can neither touch nor turn over, otherwise it will fall apart. Fry the fish on one side, you must turn it, do it better than a wooden shovel. Frying fish takes 10 to 15 minutes. It depends on the size of the pieces and fire intensity. After cooking, immediately remove the fish from the pan, otherwise it will soak the oil and will have an unpleasant taste. In cooking, I share a few simple ways of frying fish. The main ones are: frying fish in a pan with a small amount of oil, roasting on open coals or deep-fried. Each method of cooking has its secrets, and if you ignore them, you can ruin the fish and not get the desired result. Before you fry the fish in the pan, you should divide it into portions (small fish can be fried whole), RUB with salt and leave it for 10-13 minutes. To improve the taste of sea fish it can be sprinkle with lemon juice. Once the fish is ready for frying, put a frying pan on the fire and poured vegetable oil. Fish dumped in the flour and put into the pan. The fat should cover only half the fish, so it was not too greasy. The fish turned out delicious, should put the butter. To keep for a long time the fish in the pan is not recommended that the meat was not dry. Enough to fry it before occurrence of crunchy crispy crust and then place in the oven for 10 minutes. There are fish to reach readiness. This method of cooking you can cook any fish. To roast fish on an open fire on a spit, the grill or skewers. When frying fish on the grill need to be aware of one feature. To ensure that the fish did not stick to the grill, you need the rods to be lubricated with oil or lard. Then we will be able to maintain the integrity of the finished fish. Before you put the fish on the grill, it needs to be dry, RUB with salt, pepper, butter, sprinkle with breadcrumbs. On the grill the fish is fried on both sides. When frying fish on skewers will be able to preserve its integrity and sear evenly on all sides. But with this method of cooking will be able to lay in the abdomen herbs. When roasting on the spit preference is given to sturgeon species of fish. In order to emphasize its flavor, the fish pour the creamy melted butter. For cooking fish in the oven requires a large amount of vegetable oil, which should completely cover the fish, and dishes with thick walls and bottom. Fish should be prepared. It, add pepper, salt, lemon juice, cracked pepper and sprinkle with flour or breadcrumbs for breading. Oil you can use sunflower or olive. After the oil is warmed up, it lowered the prepared fish. You should fry until the acquisition of its Golden hue. This method prepares any fish, but especially tasty sturgeon, cod, perch or cod. Deep-fried you can cook fish in batter. To do this, the pieces of prepared fish with a fork dipped in the batter and then put in the fryer. After frying, the fish should be put on paper in order to remove excess fat. 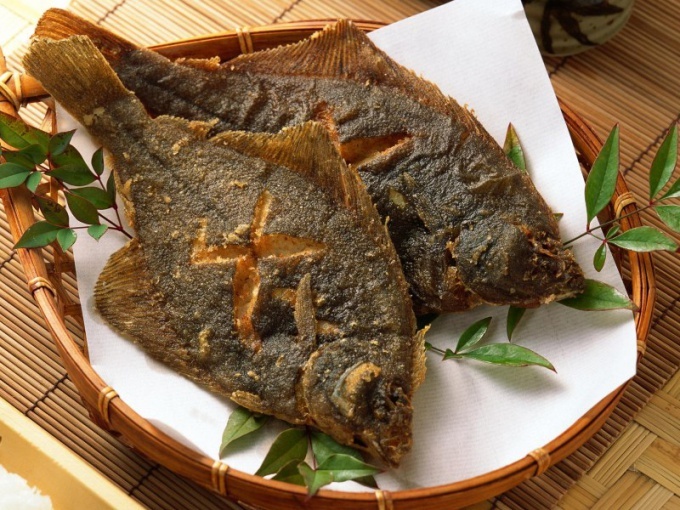 Fried fish are ideal side dishes of greens, potatoes, vegetables and rice. And pickles and so accentuate the unique taste. Decorate the dish of fried fish with onion rings, herbs, or lemon. Potatoes, peeled and cut into wedges, will help to get rid of the smell of fish while cooking in the pan. To do this, it just needs to be put into the oil during frying.